Along with visits to residential camps, ExPats and Brats at the 2009 Kingdom of Saudi Arabia reunion visited some of the beautiful sites throughout the country. Shaybah, on the edge of the Rub‘ al-Khali, or Empty Quarter, desert, was established as a Saudi Aramco oil reserve in the 1990s. Pumping half a million barrels of oil per day, Shaybah is the largest oil development in the past 20 years. It’s proximity to the beautiful, rust-colored dunes of one of the world’s largest sand desert make this day trip a must-see for all visitors. On Wednesday, many annuitants and brats visited the Shaybah. As the plane was arriving a massive wall of sand (shamal) came across the desert. In spite of the shamal, the former Aramcons really enjoyed their trip. When it was announced that the lack of visibility may delay their leaving that evening, the adventuresome expats said, "Fine, bring pillows to the rec room and we will sleep on the floor. No problem!" Reunion attendees also had the pleasure to relive the wonderful and unique shopping opportunities in Saudi Arabia. On two separate day trips to Hofuf, visitors found a variety of unique works at traditional Arabian suqs, and also had the chance to visit Othaman Dairy Farm and a camel market. Visits to nearby pottery caves and Ibrahim Palace were also on the itinerary. A few years back, the old covered suq in Hofuf burned to the ground; however, there continues to be a few merchants peddling their wares. An in-Kingdom trip to Jeddah fills out the week’s agenda. 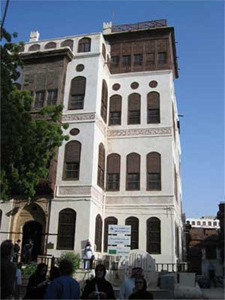 Jeddah is located on the western coast of Saudi Arabia on the Red Sea, and it is the second largest city in Saudi Arabia; it’s also considered the commercial capital of the country. Visitors also took trips to the Asir and Madain Saleh. On these trips, ExPats, Brats, and their families learned more about the various historical sites in the region. The Asir region, located in the southwest corner of Saudi Arabia, is situated on a high plateau that receives more rainfall than the rest of the country, making it an important agricultural region as well. 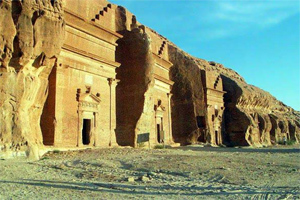 Madain Saleh is one of the most unique archaeological sites in Saudi Arabia, best known for the Nabataean era rock-cut architecture and tombs of the 1st millennium BC. Located in northwest Saudi Arabia, the city linked the Arabian Peninsula on the incense road with Mesopotamia and Egypt. It was a privilege for reunion attendees to visit Madain Saleh, which became a UNESCO World Heritage Site in 2008. These great day trips and in-Kingdom excursions are just a few reasons why the 2009 Kingdom of Saudi Arabia Reunion was a great experience for all!